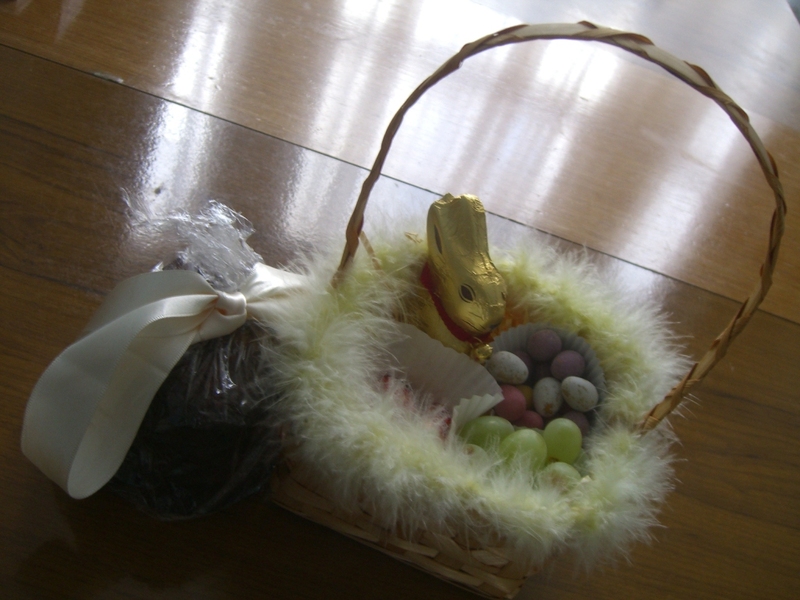 Chocolate cookies, Lindt Bunny, grapes, mini-eggs and Lindt eggs. Mmmm. Again my photography skills have let the baking down – the chocolate cookies here are really divine; melty and oh so chocolatey. The weird thing about them is they have marmalade in. As with all biscuits, they are actually done before they look done – the ones on the middle were soft and the edge ones were hard. Which way you like it might be a matter of preference, but for me the gooey meltiness of the “just-done” biscuit is divine. I’d really want to make these again and try to get the whole batch gooey because the extreme chocolatyness was overwhelmingly tasty. Ingredients: 110g margarine, 50g soft brown sugar, 110g plain chocolate (melted into the mixture), 110g milk chocolate (chunks), 2 tablespoons marmalade, 175g self-raising flour. Who made it: Anna did everything. Recipe: Baking, Making and Sharing, by Susan Over, page 14.